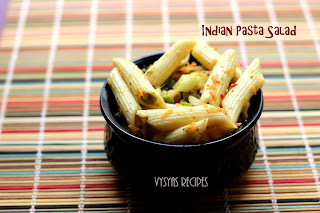 Pasta Salad is an Easy filling snack or Breakfast/ Dinner Recipe, that can be made in jiffy, if Pasta is cooked. Fresh Onion,cucumber,carrot, cooked Peas are added with Pasta & spiced with crushed Pepper & Chilli flakes. Dieters can also have it as a Meal. Cooked Pasta - 2 Cups. Crushed Pepper or Pepper Powder - 3/4 tsp. Take the water in wide vessel and bring it to rolling boil, then add Pasta, cook till pasta is soft and firm. stir now and then, to avoid pasta gets stick to vessel. Then drain it in a colander, and Pour cold water over it, to avoid it getting cooked further.Now Pasta is Ready. Take a Pan add needed water to Peas & cook, till it turns Soft, or you can Pressure cook it for 2 whistles. First Mix oil, black Pepper, Chilli flakes & salt. Now Salad dressing is Ready. 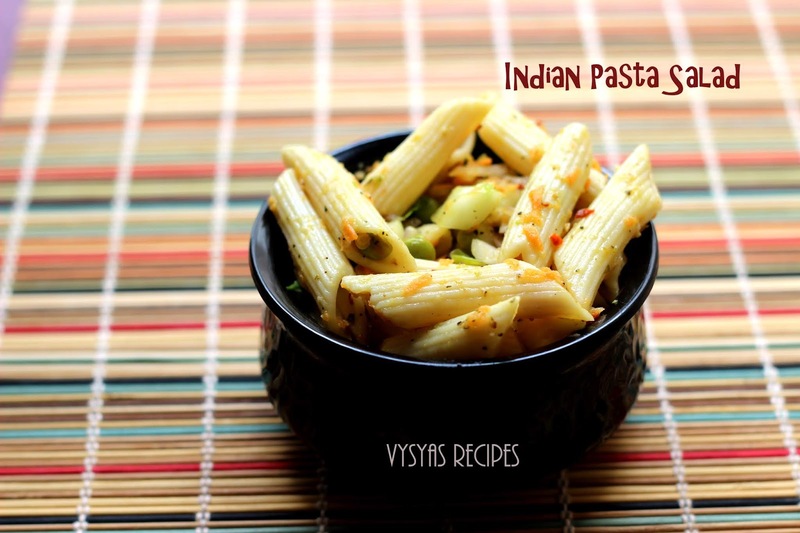 Take a wide Mixing vessel add finely chopped Onion,Grated Carrot, diced Cucumber,Coriander leaves ,Cooked Peas & Pasta. Sprinkle dried Oregano. Add the mixed Salad dressing over it & toss Gently for even Coating. Now Pasta Salad is Ready. Serve Immediately. You can add Chopped Capsicum or cooked Corn. you can add 1 tbsp of honey for distinct taste. you can also add cooked Mushroom for extra Nutrition. you can add 1 finely chopped tomato or cherry tomato for tangy taste.